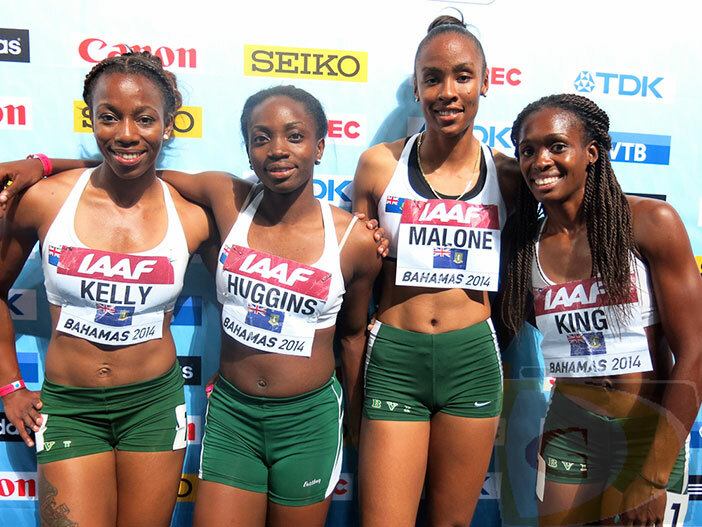 MAY 25, NASSAU, The Bahamas—The British Virgin Islands Women’s 4x100m Relay team ran the second fastest time in the territory’s history to reach the B final of the inaugural IAAF World Relays here in Nassau, The Bahamas and finished in the top 16. Knowing just before they left that Tahesia Harrigan-Scott would not be joining them after pulling out of a race in Beijing, China on Wednesday with slight discomfort, the trio of Ashley Kelly, Chantel Malone and Karene King, knew they’d have to help National Youth and National Jr. 100/200m sprinter Nelda Huggins at 17, one of the youngest women in the competition. With only one day’s practice, they got the stick around and finished the semi final in 44.53 seconds just off the 44.34 national mark established in 2010 as the territory haven’t had many opportunities to field a senior squad in competition. In the B final, they placed seventh in 45.06 and all shared that it was a good experience. practicing. Since they don’t’ get an opportunity to be together often, the hand off was a challenge.